As someone who has been on staff less than a year, many of Phi Tau’s education programs are still new to me. I was lucky enough to experience National Convention last summer within my first month or so on staff, and again Presidents Academy and Volunteer Development Institute in January of this year. So, when the opportunity to attend a Regional Conference presented itself, I hopped in the car and made the trip to Flying Horse Farm Camp, just thirty minutes north of Columbus. Flying Horse Farms is also the first SeriousFun Camp I have gotten to visit. It’s located just off I-71, the highway that stretches across Ohio from Cincinnati to Cleveland, and the closet Regional Conference location to the Executive Offices in Oxford. Members came from Ohio University, Ohio State, Mount Union, Bethany, Michigan State, Case Western, Akron, Baldwin Wallace, Kent State, Westminster, Muskingum, Indiana University of Pennsylvania, Saginaw Valley, and Kenyon to participate in one of three tracks: Leadership, Prevention & Wellness, and Recruitment & Retention. After a brief introduction from facilitators and staff members, the different tracks headed off to their various buildings and got to work. Prevention & Wellness, led by Nick Tereck, Saginaw Valley State ‘08, and Makenzie Jones began with introductions and a game where participants sat back to back, with one member drawing a photo the other one had to describe with no obvious clues. These were as simple as a square house and as difficult as a unicorn. The point was to focus on team building, verbal communication, and listening skills. As the day progressed, they talked about more serious issues that maybe be affecting their chapter – alcohol, drinking culture, and drug use. After that I jumped over to the Big Red Barn where the Leadership track was taking place. Facilitated by Tyler Veniot, Saginaw Valley State ’09, and Carly Corio, one of the most popular games played by this group was a jeopardy-fashioned decision-making game, where two members had to read a situation off a projector and make a quick decision on the context. The first to hit the buzzer – in this case, the buzzer was an unopened water bottle – gave their decision with an accompanying explanation. Some of these were met with affirmation while others were pushed back on by the group, explaining what or how they would react differently. The Recruitment Track took place in the most remote building on the property, the arts and crafts building past the cabins. Here, led by Jason Sweet, Saginaw Valley State ’09, and Jim Rosencrans, members worked on their networking and engagement skills. 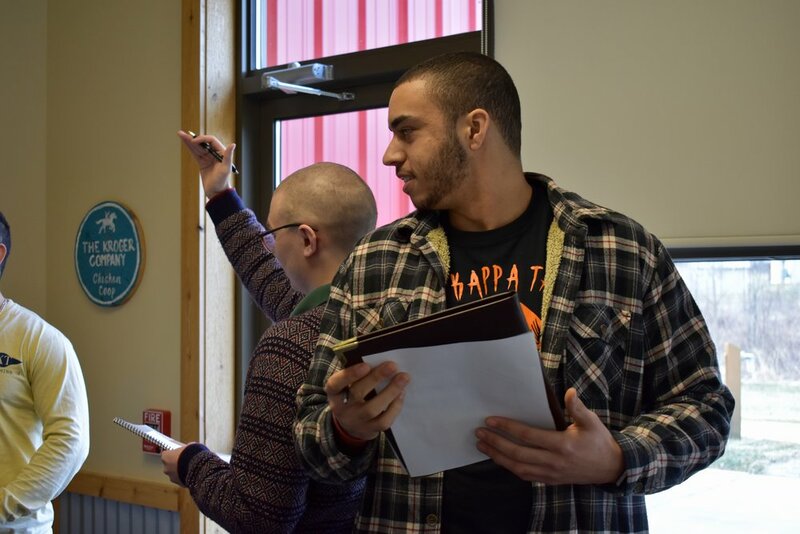 They were encouraged to share their own stories of why they joined Phi Tau, because their reasons will likely resonate with other potential members. They also did mock recruitments where one participant would approach the other to draw interest in Phi Tau. In 2005, Columbus couple Jenni and David Belford were moved to build a permanent, year-round camp for children with serious illnesses. They coined our name from the book “The Big Red Barn,” in which a “golden flying horse” weather vane sits atop a barn on a farm where kids and animals play freely. Today, a barn has been built modeled to look exactly like the one in the book, with big rafters, windows, and the infamous weather vane. Flying Horse Farms was the first midwestern camp to be included in the SeriousFun Children’s Network. Paul Newman, Ohio ’43, died in 2008, shortly before the camp opened. However, he did visit the camp while it was still under construction and got to fish in the lake, one of the many things he was excited to do on the property.